Telephone calls can be made by saying the contact name in the downloaded phonebook or the name of a person whose phone number has been registered in the Bluetooth® Hands-Free. Refer to Import contact (Download Phonebook). Wait for the beep sound. Say: “Call XXXXX... (Ex. “John”) Mobile”. Follow the voice guidance to place the call. the home screen and display the Communication screen. Select the contact you would like to call to display the details for the contact. Select the desired phone number to make the call. The “Auto Download Contacts” setting must be on. When hands-free is connected to the device, the phonebook is downloaded automatically. Refer to Communication Settings on page 5-130 . If the “Auto Download Contacts” setting is off, download the phonebook using the following procedure. home screen and display the Communication screen. to switch to the device operation. Download will be started from the mobile phone. If “Import All Contacts” is performed after saving the phonebook to the Bluetooth® unit, the phonebook will be overwritten. A maximum of 1000 contacts can be registered to the phonebook. Phonebook, incoming/outgoing call record, and favourite memories are exclusive to each mobile phone to protect privacy. A maximum of 50 contacts can be registered. It will take less time to make a call after registering the telephone number. In addition, you do not have to look for the person you want to call in the phonebook. Select from the displayed list. When “Add New Contact” is selected, information such as the selected person’s name is also registered. In addition, when “Add New Contact Details” is selected, only the telephone number of the selected person is registered. (Only one phone number is registered to contact) Select the contact information you would like to call. Go to Step 5. (Multiple phone numbers are registered to contact) Select the contact you would like to call to display the screen indicating the details for the contact. Go to Step 4. Select the phone number you would like to call. Select the contact information which you would like to delete. The contact can be moved after it is selected. screen and display the Communication screen. Select the contact to display the keyboard screen. is selected, the contact name is stored. If the contact is long-pressed when the favourites list is displayed, the contact information can be edited (deleted, moved). Input the telephone number using the dial pad. Select to make the call. Long-press the to input +. Makes a call to the last person called (latest person on outgoing call record) from the mobile phone/vehicle. Makes a call to the last person who called your (latest person on incoming call record) mobile phone/vehicle. When an incoming call is received, the incoming call notifi cation screen is displayed. The “Incoming Call Notifi cations” setting must be on. The following icons are displayed on the screen during a call. Icons which can be used differ depending on use conditions. If the ignition is switched off during a hands-free call, the line is transferred to the device (Mobile phone) automatically. 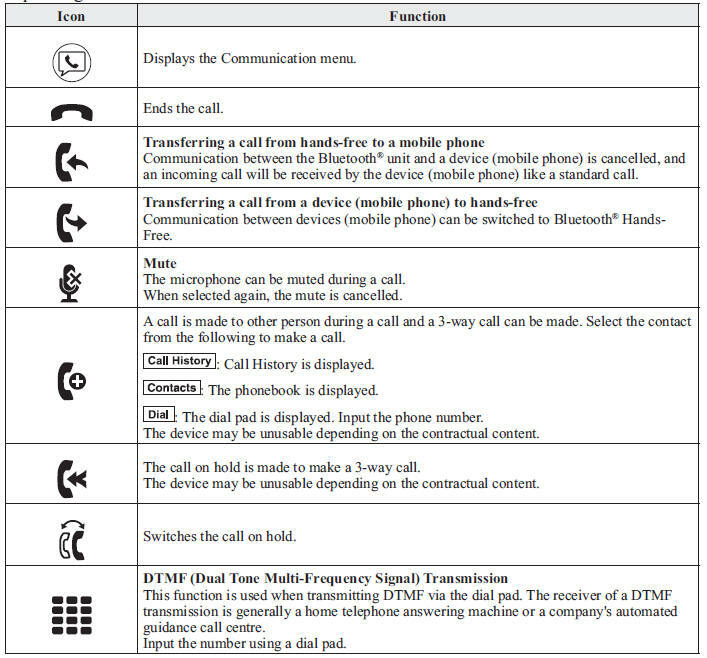 If the DTMF code has two or more digits or symbols, each one must be transmitted individually. current call is ended and the system switches to the new incoming call (GSM network only). hang-up button on the steering wheel is pressed, an incoming call is refused. SMS (Short Message Service) messages, and E-mail received by connected devices can be downloaded, displayed, and played (read by the system). Additionally, replies can also be made to calls and messages in the received messages. Up to 20 new messages can be downloaded and displayed from a connected device. For e-mail, 20 messages for each account can be downloaded. The “Auto Download Email” (E-mail) or “Auto Download SMS” (SMS) setting must be on. A message is downloaded automatically when the Bluetooth ® unit is connected to the device. When the “Auto Download Email” (E-mail) or “Auto Download SMS” (SMS) setting is off, the message is downloaded using the following procedure. Attached data is not downloaded. Messages up to 1 kilobyte (e-mail)/140-bytes (SMS) can be downloaded. A message list is created for each device. If the connected device does not correspond to MAP 1.0, the AT command is used to download. The downloaded message indicates that it is already read. Downloading using the AT command may not function depending on the connected device. When a device receives a message, a message received notifi cation is displayed. The “Email Notifi cations” (E-mail) or “SMS Notifi cations” (SMS) setting must be on. Select and display the message. message list for e-mail and SMS. Select the message you would like to display. 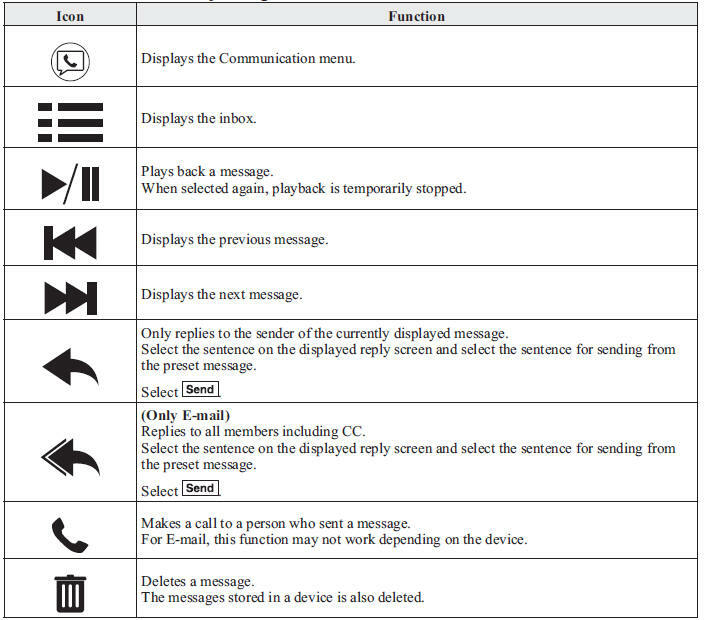 The following icons are displayed in the lower part of the details on the message. Icons which can be used differ depending on use conditions. Up to three preset messages can be selected. Select the unread message displayed in bold. The details of the message are displayed and replying to the message, making a call, or playback can be performed. Select the account which you would like to display. Only the messages for the selected account are displayed in the inbox. Select the preset message which you would like to edit. The keyboard screen is displayed. selected, the message is stored as a preset message. to switch between capitalized and lower-case characters. return to the previous screen without storing the edit. Bluetooth ® — Go to Bluetooth ® setting menu. Incoming Call Notifi cations On/Off Notifi es when an incoming call is received. Auto Download SMS On/Off Downloads SMS automatically when the Bluetooth ® unit is connected to the device. SMS Notifi cations On/Off Notifi es when a new SMS is received. Auto Download Email*1 On/Off Downloads E-mail automatically when the Bluetooth ® unit is connected to the device. Email Notifi cations On/Off Notifi es when a new Email is received. Auto Download Call History On/Off Downloads Call History automatically when the Bluetooth ® unit is connected to the device. Auto Download Contacts*1 On/Off Downloads the phonebook automatically when the Bluetooth ® unit is connected to the device. Ringtone Fixed/In-band/ Off Changes the ringtone setting. Phone Volume Adjusts using the slider. Adjusts the conversation volume. VR and Ringtone Adjusts using the slider. Adjusts the voice guidance and ringtone volume. Contacts Sort Order First Name, Last Name Displays the contact information in alphabetical order of the fi rst name. Last Name, First Name Displays the contact information in alphabetical order of the last name. Preset Messages — Edits the preset message. Refer to Receiving and Replying to Messages (available only with E-mail/SMS compatible phones) on page 5-127 . Reset — Initializes all Communication Settings.